While many in the media lament President Trump's campaign promise to “do a number” on the Dodd-Frank legislation passed after the 2008 financial crisis, not much will happen until the 120 day review has passed and the data is reviewed by the president. 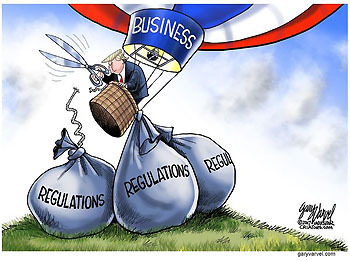 The president has a clear vision on the burdensome restrictions Dodd-Frank inflicted on banks and their ability to lend money to small and large businesses. This put many businesses at a disadvantage during a very slow economic period thus retarding needed growth. President Trump wants America to be the most competitive in the world against their foreign rivals. To make that happen, banks need to get back to lending which Dodd-Frank slowed and in some cases stopped altogether. Some of the principles that will guide regulators according to the president must be “efficient, effective and appropriately tailored” and “foster economic growth”. Rules like the Volcker rule - restricting banks from making any kind of speculative investments - and the Durbin amendment - limiting fees charged to retailers for credit card processing - are two clear targets in my opinion. While each sounds good on the surface, they limit banks from making money and in turn they have less money to lend. President Trump has made it crystal clear he will not allow another taxpayer bailout and wants to make sure “too big to fail” never imperils the economy again. However he understands banks have been handcuffed with what has clearly been an overreaction to the 2008 crisis. Simply put Dodd-Frank is far too strict. If the president get the changes he wants, it will increase the potential for bad behavior at the banks. Therefore any changes must be met with a serious focus of prosecuting excessive risk taking. To date not one person who helped cause the crisis of 2008 has faced criminal charges. That needs to change. Mr. Trump wants to “Make America Great Again” and we are all for it. However with unleashing the banks, there are risks. Banks need to lend but do so responsibly. Also we can not overlook the potential for serious price inflation once the system is unleashed to work the way capitalism is intended. With changes coming fast and furious from the new administration I cannot over-stress the importance of gold in a diversified portfolio. Many of these changes will have unintended consequences which are impossible to predict. So be prepared for the unknown as, for the first time in modern history, we have a non-politician leading our nation. I remember when Ronald Reagan took office in January of 1981. Everyone thought the worst was over and the best was to come and it was. However, Mr. Reagan along with Fed Chairman Paul Volcker raised interest rates, created a deep recession and the pain was felt throughout the country. Mr. Reagan knew America was going to suffer a bit if things were to truly change. By the end of his first year, President Reagan wasn't a popular president. In fact many questioned his character, intelligence and honesty. By 1982, the economy starting showing signs of growth. By 1983, we were back on track and the painful measures implemented set America up for three decades of solid growth. President Trump has promised to “drain the swamp”. I believe he will. Dodd-Frank is a small part of that process. But using his analogy is not a nice, easy and clean process - just the opposite. It is messy, dirty and sometimes ugly. However we either do it now voluntarily; or involuntarily when the debt crisis hits. Our leaders have kicked cans down roads for far too long. If we are sincere in our expressions of wanting a better future for our children and want them to have freedom from the debt they neither asked for or created, it must be done.